Often a question is raised whether it is better to be a specialist rather than a generalist. There is no perfect answer to this. It depends on situations and availability of opportunities. As regards choosing a career, generalists have a wider choice. However the number of candidates competing for generalist positions is always much higher. There are lesser number of specialist job positions and number of people who hold qualifications to apply for such positions is also comparatively less. Whether one wants to remain a generalist or grow into a specialist can be a matter of personal choice also. We all know that our country has more job seekers than jobs available. In such a situation it becomes a challenge to get into a job of one's choice. However with an objective understanding of one's aptitude, by being clear about one's career preferences and adequate preparation, this challenge can be met. You have to be realistic and put enough hard work in stand out in the competition. Banking is one industry which has continuous demand for people as employees. In past 5-6 years maximum number of job opportunities in the country has come from banks. Public sector banks have been a front runner in this. Many young people in our country aspire to work with public sector banks for obvious reasons like job security, reasonable compensation and benefits combined with growth opportunities. 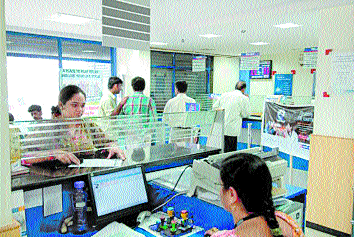 For bulk of job seekers, public sector banks are known to have positions of clerks and probationary officers. These are generalist positions which are open to graduates from all disciplines. However specialist positions are also available in these banks though their number may be much less when compared with opportunities in general banking. There may be situations when a person on the basis of his or her qualification is eligible for both generalist and specialist positions. Data of recent years show that many qualified engineers with degrees like B.E. and B.Tech. have joined public sector banks as clerks and probationary officers. However such qualifications make you eligible for specialist positions as well. Agricultural Field Officer : Public sector bank branches have been given a mandate to support all kind of agricultural activities. These include direct, indirect and high tech agriculture. At rural centres a major portion of financing by bank branches comprises of loans to farm sector. Agricultural officers mainly look after banking needs of farmers and agri entrepreneurs and process related loan proposals. They are required to make field visits, inspect the physical property in form of land and buildings etc. and make assessment of loan requirements of the applicants. They also contribute in recovery efforts. After some experience they can be placed as branch manager of a rural branch. To apply for the position of Agricultural officer you should have 4 years graduate Degree in any of these subjects- Agriculture/ Horticulture/Animal Husbandry/ Veterinary Science/ Dairy Science/ Fishery Science/ Pisciculture/ Agri. Marketing & Cooperation/ Co-operation & Banking/ Agro-Forestry/Forestry/ Agricultural Biotechnology/ Food Science/ Agriculture Business Management/ Food Technology/ Dairy Technology/ Agricultural Engineering. Information Technology Officer : During past decade banking sector has adopted technology in a big way. If you visit a bank branch you find almost every one working on computers. Thick huge ledgers have been replaced by digital files. With establishment of core banking platform, banks have been able to integrate their operations. Now it has become possible to transfer funds from one branch to other and one bank to other electronically. Banks are making every effort to popularize internet banking, mobile banking and other forms of digital banking transactions. Banks have made huge investments in technological infrastructure. This infrastructure consists of data centres, hardware, software, information security and other tools. Qualified information technology professionals are required to take care of such infrastructure, help and guide employees in use of technology and ensure smooth banking operations with technology as a support function. For the position of Information Technology Officer , candidates are required to have B.Tech or B.E. Degree (of 4 years' duration) in Computer Science/ Computer Applications/ Information Technology/ Electronics/ Electronics & Telecommunications/ Electronics & Communication/ Electronics & Instrumentation or Post Graduate Degree in Electronics/ Electronics & Tele Communication/ Electronics & Communication/ Electronics & Instrumentation/ Computer Science/ Information Technology/ Computer Applications. Graduate having passed DOEACC 'B' level are also considered eligible. Having an engineering diploma is not sufficient for the position. HR/Personnel Officer : All public sector banks have a large number of employees deployed to manage their operations. Manpower planning and human resource development strategy have to be put in place to make sure that all units (branches/administrative offices etc.) function in a smooth manner. Also like every progressive organization banks have to ensure optimum utilization of their human resource with suitable mechanism for their growth and development .Here comes the role of HR or Personnel Officers .Every bank has a HR department at their head office and other controlling offices like regional, zonal or circle office. While being positioned there HR officers have to look after one or more of various HR functions viz. recruitment, promotion, transfer and placement, compensation and benefits, training and development, employee relations, disciplinary matters and human resource management systems etc. Eligibility criteria for HR/Personnel Officer are simple. The applicant should have Post Graduate degree or Two Years Full time Post Graduate diploma in Personnel Management / Industrial Relations/ HR / HRD/ Social Work / Labour Law. Law Officer : The business of banking works on the laws, rules, regulations and practices of banking. There are various provisions in law to regulate banks and their operations. These include Negotiable Instruments Act, Banking Regulation Act, Bankruptcy and Insolvency Code among others. In various cases of disputes, banks need to adopt legal recourse by way of filing suits etc. Also there is need of legal interpretations. Banks also have to make sure that all their forms and documents are as per provisions of law and take care of their interests. Law officers are involved in providing legal opinion, drafting of plaints and documents and attend to matters of Right to Information act. They also guide branches and senior management in legal matters. A bachelor's degree in law (LLB) and enrolment as an advocate with Bar Council is the prescribed criteria for entry level position of law officer. Marketing Officer : Public sector banks are commercial entities that is why these are also known as commercial banks. Like any other commercial organization these banks also have to focus on business growth, maximizing profit and shareholders' value . Marketing Officers are appointed to give a boost to these efforts. Their job is to bring leads, mobilize business and help achieve bank's budget. Marketing Officers are also involved in developing market plan, formulating marketing strategy; undertake market research, promotion and publicity etc. Their skills and services are of immense help in marketing campaigns. Marketing Officers may significantly contribute in making their organization face the competition in business. For the position of Marketing Officers the applicants are required to have two Years Full time Management degree with specialization in Marketing which include MMS (Marketing), MBA (Marketing), PGDBA / PGDBM/ PGPM/ PGDM etc. Official Language Officer : Section 343(1) of our constitution says that Hindi shall be the official language of Union of India. Accordingly all central government departments and undertakings are required to use Hindi in their internal working and other communication. All these bodies are required to implement provisions of official Language Act and Rules. Official Language Officer often known as Hindi Officer and Rajbhasha Officers, are appointed to help implement these and promote use of Hindi by the organization and its employees. The job of Hindi officers involve translation of circulars, manuals etc. , preparation of Hindi content in form of training and publicity material, organizing Hindi workshops, bringing out Hindi publications, conducting training sessions etc. They are also required to conduct periodical meetings and represent their organization at various forums. Post Graduate Degree in Hindi with English as a subject at the graduation level will make you eligible for the position of Hindi officer .Those having Post graduate degree in Sanskrit with English and Hindi as subjects at the graduation level are also eligible. In all the cases those who have obtained their degree through correspondence or part time course are ineligible. Selection process : The selection process for the above specialist positions consists of three stages viz. preliminary examination, main examination and interview. Preliminary examination for post of IT Officer, Agriculture Field Officer, HR Officer and Marketing Officer will have questions of English language, reasoning and quantitative aptitude whereas for Law Officer and Hindi officer questions will be from English language, reasoning and General Awareness with special reference to Banking Industry. There will be in all 125 questions to be attempted within maximum time limit of 2 hours. Those who qualify in Preliminary examination will be called for the main examination. Main examination is aimed to test professional knowledge in the specialized area. For Hindi officers the test will be in two parts of objective and subjective questions with total time limit of 1 hour. For others the 45 minute test will comprise of only objective questions. All the above tests will be through online mode. Shortlisting for interview will be based on the score obtained in main examination only. For test of reasoning and quantitative aptitude : Questions of reasoning may relate to verbal statements, diagrams, series etc. Quantitative aptitude will have questions relating to numbers and arithmetic. For both the subjects initially you should go through a lot of solved examples to understand how the conclusions are arrived. Afterwards attempt model questions on your own and check your answers. Wherever you've made mistakes, questions need to be worked upon again. When you begin your preparation you may take as much time to solve as you find necessary but in the later stage you should solve model question papers within prescribed time limit. Accuracy is as important as timeliness. Intensive practice is of utmost importance to score well in such tests. For test of General Awareness : A good general knowledge book has to be the base for your preparation here .Also regular reading of newspapers and keeping a watch on current affairs is required. Equally important is to track developments related to banking and finance. Expect questions related to demonetization, foreign exchange reserves, GDP growth rate, Goods & services tax and other areas/aspects of economy. Keep a diary to take note of significant developments to refer to it during course of your preparation. For test of professional knowledge : Here the questions will be from your area of specialization like law, marketing, HR etc. Refresh your knowledge of fundamental concepts (for example market segmentation in case of marketing or performance appraisal in case of HR).Applicants for the position of Hindi officers should focus on vocabulary, word meanings and translation. Guides and workbooks are available in the market. If you search you will find ample resources for preparation online which come for free. Make best use of such material. It will be highly useful to talk to one or more persons who had taken the test in previous years to learn from their first hand experience. Even if you begin your career as specialist officer in a bank , you may switch to general banking subject to conditions prevailing in individual banks. This also is a matter of personal choice to be exercised at appropriate time. (The author is a Bank Officer and career counsellor based in Mumbai. e-mail : v2j25@yahoo.in)Views expressed are personal.